Facts about Google wave continues …. Do you know your Google Wave ID (like mine is contactfornitish@googlewave.com) is nothing sort of Email ID means no one could send an email over the same address and only waves could be sent over the same. Do you know Wave uses your regular Google Account’s contact list means if any of your contacts are also using Wave, those people automatically show up in your Wave Contact List. Do you know the best visible difference between a Wave conversation and Email conversation is that you can add contacts anytime later on and they could follow the conversation fro right there and could read the earlier lines etc. Means not needed to be CC from start if it was case of email. Do you know even if you don’t have any contacts online in Google Wave, you can go for participating public waves anytime with typing the special query with:public and it will return a firehouse of constantly updating waves like the case of twitters. A better luck would be targeting your query over particular topic like with: public firefox, which will return wave related to firefox only. Do you know Wave is not something completely browser independent. Wave uses recently developed web standards, such as HTML5, to perform a lot of its behind the scenes magic. So, for the richer experience from Wave, you need a browser having full support to HTML5 like Google Chrome, Firefox 3.5+ or Safari 4. 1. Reply below a Blip. 3. Edit the existing content of a Blip. Do you know as of now, Internet Explorer can’t run Google Wave properly as it doesn’t have support to HTML5. Although Google has released an open source browser plugin for bridging the gap. 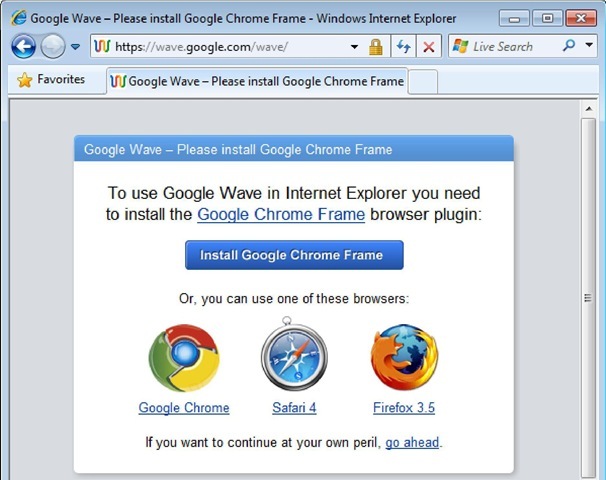 Wave prompts Internet Explorer users to install the same plugin in following way. Do you know As of in early stages of it, Google Wave is struggling about Mobile devices as most the mobile browsers are not fully supporting to it and one could get it only after avoiding the warning of browser not supported. Do you know your Wave Contact List is a subset of your Google Account’s exisiting Contacts list and you can add people to your Wave Contacts List only if they already have a Wave Account. Do you know as of now, there is no way to remove a contact from a wave once added with the exception of bots. Do you know as in theory Google Profiles are the same as Wave profiles and so you could edit yours to have links, hobbies, photos for the same. Do you know every time a wave updates, it moves to the top of your inbox and its subject line turns bold. Wave’s instant, real-time notifications are a double edged sword; wonderful when you’re waiting on important updates, terrible when new information you don’t care about distracts you. the achieve and mute buttons can help you clean out your inbox and silence chatty waves one by one. In the similar ways like emails, waves could be marked read or unread and also could be arranged within folders and subfolders. Do you know although was available as a privilege to blog posts only, now tags are part of waves as well and playing the same role as was in case of blog posts. Tags provide a more free-form way to file your waves. Unlike folders, you can add as many tags to waves and also unlike folders, anyone participating could see those tags. Do you know as of now, Wave doesn’t recognize special search characters like square brackets, parentheses, currency symbols, the ampersand, the pound sign and the asterisks. It also doesn’t recognize partial or similar matches, so a search for “travel” doesn’t find “travels”, “traveler” or “Travle”. Do you know If your browser has the Google Gears plug-in installed, you can drag and drop files from your computer directly into your wave. (Gears comes with Google Chrome for Windows and its freely available to install on Firefox, Internet Explorer and Safari for Mac). Do you know If your wave contains multiple images, then an Images button appears next to the Files button on the bottom of that wave. Click the Images button and Choose View as Slide Show to easily flip through the photos at their full size. Do you know how can we can make a wave public? Here is the trick. Add the public@a.gwave.com wave ID to your contacts list the way you would any other contact (although you will get the warning that user doesn’t has any Google Wave Account but you need to continue anyway). Add the same ID as participant to any of your wave and your wave would be a public wave right then. Up/Down Arrows Moves you up and down the blips in a wave. Home Takes you to the first blip in a wave. End Takes you to the last blip in a wave. Space Takes you to the next unread blip in a wave. Page Up/Page Down Scrolls a panel up and down a page at a time. Ctrl+Space Marks all blips "read" when focus is on the Wave panel. Enter Replies to a blip at the same level of indentation. indentation level, at the very end of the wave. Shift+Enter (in edit mode) Ends your blip editing session (same as the Done button). Ctrl+U Underlines/removes underline from selected text. Ctrl+G Adds color to text via "poor man’s rich text" pop-up, in which you can type a color name (like "blue" or "red") or enter the hexadecimal HTML color code. Ctrl+[n] Makes the current line a heading, where [n] = 1 through 4 for different sized headings. Ctrl+6 Removes formatting from text. Space+Right Moves to the next slide. Shift+Space Moves to the previous slide. Down / Page Down Moves to the next set of thumbnails. Rest will come up as I learn more and more about Google Wave.